Some of these recipes are old family favorites and some are new this year. 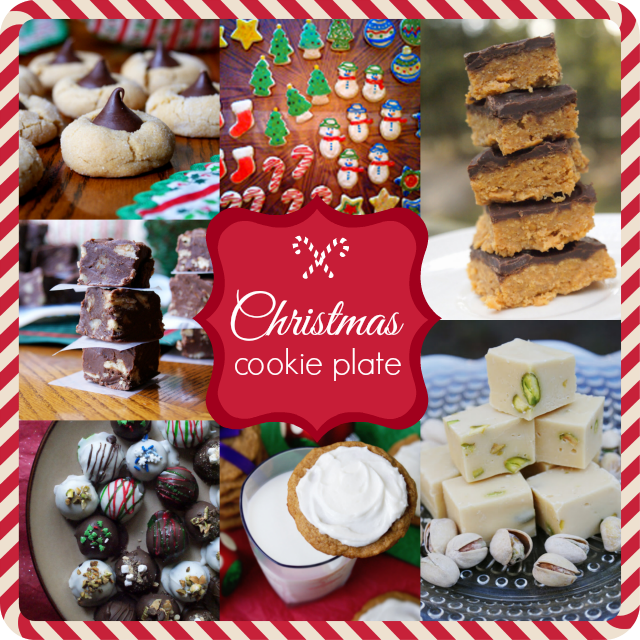 New or old, if you make this collection of delectable sweets, you'll have one fabulous cookie plate to share with family, friends and neighbors! So, pull out the cookie sheets, the measuring cups, the chocolate chips and the sprinkles start working on your festive holiday platter! Happy Holidays from me and mine to you and yours! 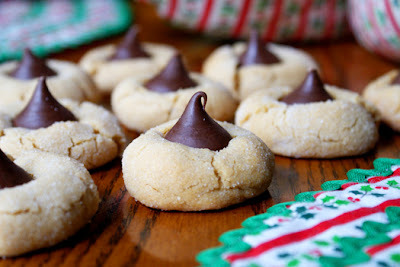 The classic soft and chewy peanut butter cookie rolled in sugar and topped with a chocolate kiss. A Christmas classic that we make every year! 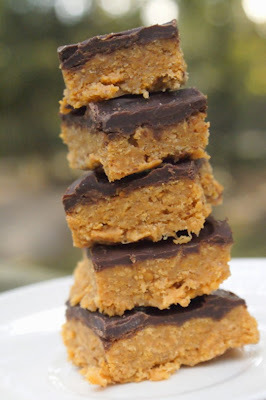 I just love the peanut butter and chocolate combination. I use Martha Stewart's sugar cookie recipe to cut out festive holiday shapes and then decorate them with a glossy icing that hardens to a perfect stackable shiny finish. 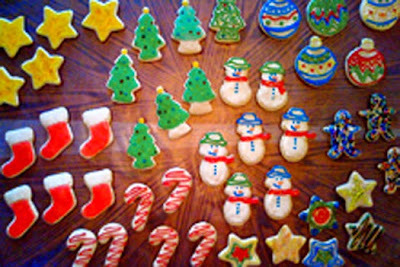 Every kid loves a sugar cookie, especially when they are snowmen and candy cane shaped! I think these may be my very favorite addition to my cookie plate. They are made with a corn flake and peanut butter base and topped with a sweet and delicious chocolate layer. We've been making them since I was a kid. 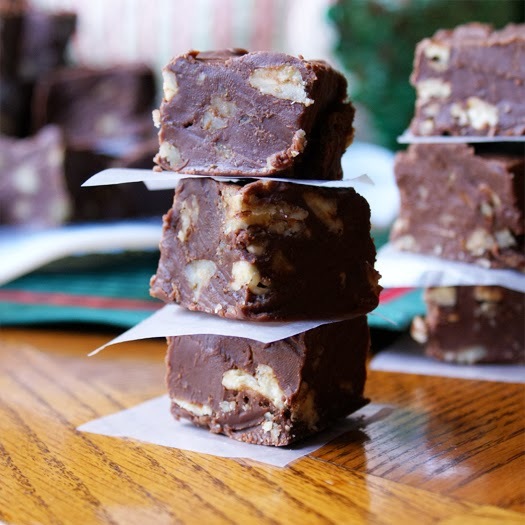 This fudge is in the Top 5 most popular recipes on my blog. No big surprise there because it is so good! Bailey's Irish Cream pairs perfectly with the mellow white chocolate and salty pistachios. Yum! This is an easy recipe for a basic cream cheese frosting that tastes heavenly on spice cookies (or cakes, cupcakes or any other cookie, for that matter)! Try this frosting on your cookies this Christmas. 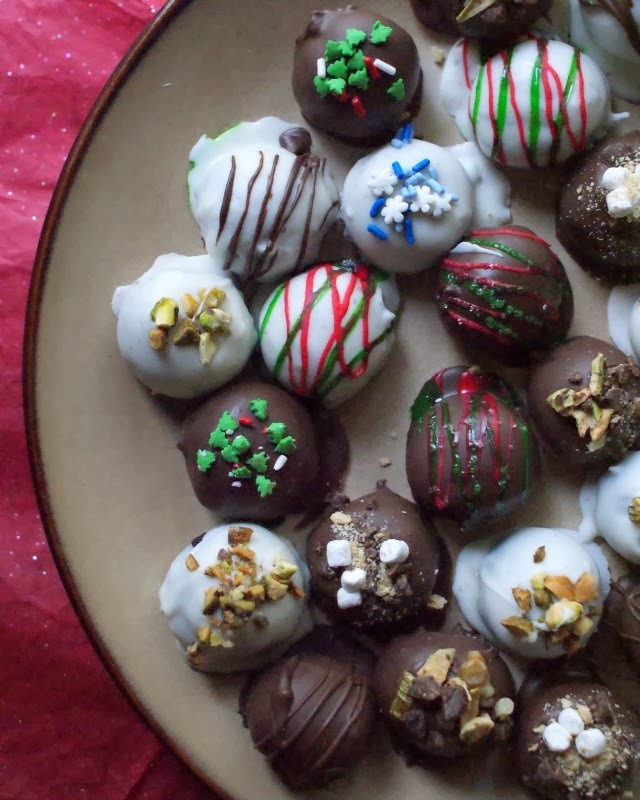 These no-bake cookie balls are a fun twist on a Christmas cookie and are so festive topped with red and green sprinkles for the holidays. These didn't last long in my house! We loved them! There is nothing better than indulging in a little morsel of fudge. 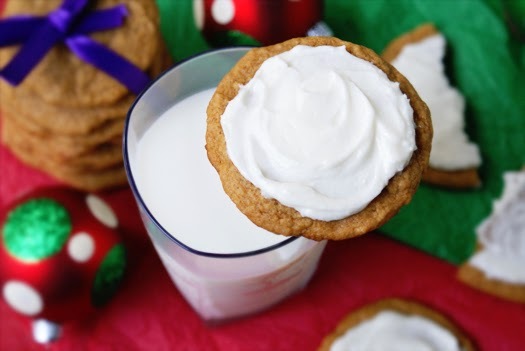 This is an easy and customizable recipe that would be the perfect addition to any cookie plate. I made mine with pecans, but it would also be amazing with other nuts like almonds or walnuts.